This article will cover unsolicited aerial spraying of pesticides, herbicides and other agricultural chemicals on private land in Oklahoma, and what rights and responsibilities are implicated. Ever seen an airplane that is flying over a field, with a cloudy trail behind it? What you are seeing is an air pilot conducting an Aerial Spray of the land that he is flying over. Another way of describing it might be “crop dusting.” Either way, an airplane is emitting an airborne chemical with the intent of affecting the land and crops at the ground level. 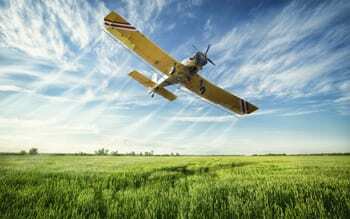 What is the purpose of aerial spraying of land? The aerial spray allows for an efficient spraying of a very large mass of land. Aerial spray is often utilized to apply herbicide or pesticide products to agriculture. In other words, aerial spray is a way of controlling weeds and pests over a large area of farm land in order to keep the crops free from environmental disturbances. In Oklahoma, those who use aircraft to spray land are called “Applicators.” Applicators must obtain licensing from the State Board of Agriculture. A prerequisite to obtaining a license for aerial application is to be licensed by the Federal Aviation Administration. Prior to filing lawsuit, Landowners must file report with Department of Agriculture. Landowners who have been affected by an aerial spray and wish to hold the applicator responsible for the damage cannot just go to the court house and file a lawsuit. First, the landowner must file a report with the Department of Agriculture explaining the damages to the crops or land. This report must be filed within 90 days of the damage, or before at least 25% of the crops are to be harvested, whichever is earlier. A letter containing a plain statement of the facts is enough to open a complaint and from there the Department can contact you and request additional information as they open their investigation. Once the report/complaint has been filed with the State Department of Ag., you must be willing to allow the Applicator (or his representative) onto your land to inspect the damage, and take samples if they want. If you do not follow these steps, then your lawsuit will be barred for not complying with State Regulations and will be dismissed. Oklahoma state regulations require applicators to carry liability insurance. This requirement is a prerequisite to obtaining a license. The law requires the applicator to carry insurance in the amount of not less than $100,000 for bodily injury, $300,000 for each injury occurrence, and $100,000 for property damage. Depends on the chemical that was sprayed. Some herbacides can damage plants and trees, only to see them recover the following season, and at other times trees and plants can be totally destroyed. Any person who engages in the act of aerial spraying of chemicals has a duty to do so in a safe and reasonable manner. This includes taking necessary precautions to avoid “over spraying” or spray drift. Experts in this field know what to do and how to do it, to avoid the spray drifting off target. If the State Board finds that an applicator is negligent, it can actually sanction the applicator. Notwithstanding whether or not the State takes action against an applicator, a private landowner can bring a private action in the courts for negligence and nuisance, so long as they complied with the rule, explained above, that requires a report be filed with the Dept. of Ag. Travis Charles Smith is a landowner’s rights lawyer and handles many types of cases involving damage to land, trees, crops and natural resources.